Around the figure of Christ there has grown up over the centuries a body of choral literature that can only be described as among the most remarkable in western civilization. 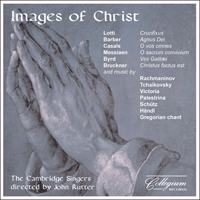 The music of this recording, all for a cappella choir, is grouped loosely according to the themes of its texts (The coming of Christ, Words of Christ, The Passion of Christ, Resurrection and Ascension, Christ in the Eucharist), drawing together composers as far apart in time and space as eleventh-century France and twentieth-century Russia and America. The aim is not a liturgical reconstruction, nor an historical survey, but rather a journey of the imagination. Outwardly Sir Edward Bairstow typified the English organist-composer of the early twentieth century: conservative, craftsman-like, gifted with a natural feeling for choral writing, and discriminating in his choice of texts. From 1913 until his death he was organist of York Minster, for the spacious acoustic of which building Let all mortal flesh keep silence was doubtless conceived. Yet this brief anthem, written in 1925, is filled with an awe-inspiring sense of mystery, majesty and power that is anything but conventional, evoking the solemn liturgical music of Russia rather than the aura of the English organ loft. One wonders what Bairstow might have achieved if he had been free to devote himself more fully to composition. The text of this chant (proper to Christmas Eve Vespers) is one of the finest of the early Christian hymns, known in many translations including Luther’s famous German version Nun komm, der Heiden Heiland. The music comes from the rich repertory of Sarum chants (that is, the chants used in the pre-Reformation liturgy at Salisbury Cathedral), and is also found in the Aberdeen, York and Mozarabic breviaries. Palestrina’s resplendent, festive setting of this favourite Christmas text was published in his Third Book of Motets in 1575. The double choir medium affords him opportunities for effective antiphonal exchanges of the seasonal exclamation ‘Noe’ which replaces the more usual ‘alleluia’. Like the Gabrielis in their Christmas motets, he uses a high choir and a low choir to symbolize the contrast between the angels in heaven and mortals on earth. Jacob Händl (sometimes known by his nickname of Gallus) was born and lived for most of his life in what is now the Czech Republic. After working as a court singer in Vienna, he was appointed choirmaster to the Bishop of Olomouc in 1579, later taking up a church post in Prague, where he died. His compositions, highly regarded in his own time, were mostly Latin sacred pieces. Omnes de Saba venient (1586) comes from the first of four volumes of motets covering the church’s year. Its opening, with a treading bass, seems to suggest the stately procession of the three kings. The greater part of Schütz’s long career was spent in Dresden, as Kapellmeister to the Elector of Saxony. His reputation as the greatest German composer of his century rests on an impressive body of over 500 works, mostly sacred. Ich bin ein rechter Weinstock comes from a collection of his German motets, the Geistliche Chor-Musik, published in Dresden in 1648. In contrast to the colourful extravagance of much of his earlier work, these twenty-nine motets call for only modest forces (and indeed the present one is intended to be sung unaccompanied), probably a reflection of the depleted resources available during the troubled period of the Thirty Years’ War. Despite Schütz’s stern preface to the volume, urging younger composers to return to the old disciplines of counterpoint, Ich bin ein rechter Weinstock, though indeed polyphonic, wears its learning lightly: its mood is genial and sunny, almost madrigalian, shedding an unexpected light on Christ’s words. Originally a song for voice and piano in Tchaikovsky’s Sixteen Children’s Songs of 1884, the composer later reworked The crown of roses (which actually bore the title Legend) for unaccompanied mixed choir. The text, by Pleshcheyev, was stated to be ‘from an English source’. The popularity of the choral version in English-speaking countries stems from its inclusion in the Oxford Book of Carols in 1928—though the piece is not by any stretch of the imagination a carol. This is the fourth of the twenty choral movements comprising Rachmaninov’s impressive and colourful Liturgy of St John Chrystostom which he wrote in 1910 following a close study of Tchaikovsky’s setting of 1879. Unlike Tchaikovsky’s setting, which had been well received by the authorities of the Orthodox church, Rachmaninov’s setting was not sanctioned for liturgical use, perhaps because the music appeared too prominent in its own right; the first performance was given by the chorus of the Maryinsky Theatre in St Petersburg, conducted by the composer. No traditional chants are used: the music is freely composed, unlike the Vespers of 1915, which did incorporate traditional liturgical melodies. In 1926 Stravinsky returned to the Russian Orthodox Church, from which he had been estranged for some time. The main musical fruit of his reconversion was the Symphony of Psalms, but he also wrote three short unaccompanied sacred choruses, Pater noster being the first of them. Originally in Slavonic, it was adapted by the composer to the Latin text in 1949. Born to a devout Austrian family, the son of an organist and a distinguished organist himself, Bruckner not unexpectedly wrote a significant amount of sacred choral music, though most of it belongs to his earlier years before symphonic composition took him over. Christus factus est is an exception: it dates from 1884, the period of the Seventh Symphony and the Te Deum. A product of its composer’s late maturity, it must be counted as the finest and most concentrated of his smaller liturgical pieces, devotional and intense in its setting of the Holy Week text. The Improperia texts (assembled from various biblical and liturgical sources including the prophets) are chanted during the Veneration of the Cross at Good Friday Mass in the Catholic church, a custom dating back to around 1200 in the Roman church but believed to be a vestige of the earlier, suppressed Gallican rite. Palestrina’s essentially very simple setting for double choir is stated by the Italian musicologist Bianchi to date from 1573, the year of the death of his son. Its manuscript is preserved in the archives of the church of St John Lateran in Rome. This is the fourth of Victoria’s eighteen Tenebrae Responsories—polyphonic settings of texts used at Tenebrae, the office replacing Matins and Lauds on Thursday, Friday and Saturday of Holy Week, during which candles are progressively extinguished. The Responsories form part of his complete Music for Holy Week, published in 1585. Although he is remembered principally as the foremost cellist of his generation, Casals was active throughout his life as a composer, though his output was small. O vos omnes, believed to date from 1932, is one of a number of sacred pieces he wrote for the Benedictine monks of Montserrat, an abbey near his native city of Barcelona. Originally for tenors and basses, it was recast by the composer for mixed choir and published in that form in 1965 in New York. Perhaps because of this circumstance of publication, Casals’ deeply-felt motet is little-known in Europe despite having become a cornerstone of the sacred choral repertory in the United States. Lotti, believed to have been born in Venice, lived and worked for most of his life there, gaining the prestigious position of Maestro di cappella at St Mark’s in 1736. Among his prolific output there is a large quantity of church music that was admired for its contrapuntal mastery and the elegance of its voice writing. Nevertheless it is his fate to be remembered today mainly for a single composition, this eight-voiced Crucifixus, which is actually an extract from a Credo written during a period of employment at the court of Dresden in 1717–19 (two other of Lotti’s Crucifixus settings, for six and ten voices respectively, are also occasionally performed). Although the piece is customarily sung unaccompanied and works well thus, this practice is anachronistic: Lotti wrote a figured bass part, and accompaniment at least by organ would have been expected. Peter Philips, like Richard Dering, stands apart from his illustrious English contemporaries by reason of exile. After childhood and youth in London as a choirboy at St Paul’s Cathedral, Philips (who was firmly Catholic) fled to the continent in 1582.After various travels, he settled in Antwerp, where he enjoyed a successful career as composer and teacher, later moving to Brussels. Surgens Jesus, from his published Cantiones Sacrae of 1612, strikingly dramatizes Christ’s words ‘pax vobis’ by setting them to three simple, block chords, like islands of peace in a sea of joyful polyphony. This joyful Ascension motet, from Palestrina’s Second Book of Motets (1572), falls into two parts, the second (beginning at the words ‘Ego rogabo Patrem’) being more tranquil in character. Both parts end with a vivid refrain to the words ‘et gaudebit cor vestrum, alleluia’. This setting of the Introit text from the Mass of the Ascension comes from Book 2 of Byrd’s monumental Gradualia (1607). It falls naturally into two contrasting halves, the first half radiating tranquillity and reassurance, the second half (beginning at the words ‘Omnes gentes’) of a more fanfare-like character. Like Philips, Dering was an English Catholic exile who worked and published his music on the continent, becoming organist to the convent of English nuns in Brussels around 1617. Ave verum Corpus comes from his first published volume of music, the Cantiones Sacrae of 1617. It is a tribute to Dering’s compositional gifts that his setting of this familiar text can withstand comparison with Byrd’s. As with Byrd’s setting, the music breathes an air of mystery and devotion, tinged with the pain of the Crucifixion. This hymn is one of the most beautiful and renowned in the repertory of Gregorian chant. St Thomas Aquinas, the Italian scholar-priest, wrote the words in 1263 at the request of the Pope, to fit an earlier hymn tune. This is a choral arrangement of Barber’s celebrated Adagio for Strings, itself an arrangement of the second movement of his String Quartet in B minor written in 1936. The string quartet version was written during an idyllic summer spent in Switzerland; perhaps aware that he had just composed the piece that would bring him fame and fortune, Barber wrote to a friend: ‘I have just finished the slow movement of my quartet today—it is a knockout!’ He shortly afterwards made the orchestral string version and offered it to Toscanini, who premiered it in one of his national broadcasts in the USA in 1938 and thereafter performed it often, making a recording in 1942. The fame of the Adagio prompted many requests for rearranged versions. Barber himself made the choral arrangement in 1967. Although it is unlikely that the Agnus Dei text had been in his mind when he wrote the string version, there is no doubt that its devotional character fits the music well. Given that Messiaen was a composer whose religious faith lay at the heart of his creative life, it is perhaps surprising that O sacrum convivium is his only liturgical motet. He wrote it in Paris in 1937 at the request of the Abbé Brun as an offertory motet and it has become much treasured and often performed outside France. Cast in the ‘transcendental’ key of F sharp major, it seems to float outside of time and space, a microcosm of Messiaen’s style. Around the figure of Christ there has grown up over the centuries a body of choral literature that can only be described as among the most remarkable in western civilization. Generations of composers, inspired perhaps by the events of Christ’s life, the words ascribed to him, prayers addressed to him, or his presence in the Eucharist to believers, have in many different ways added their personal contribution to our vision of the founder of the Christian faith, like tiles in a mosaic with an infinite number of facets. The music of this recording, all for a cappella choir, is grouped loosely according to the themes of its texts, drawing together composers as far apart in time and space as eleventh-century France and twentieth-century Russia and America. The aim is not a liturgical reconstruction, nor an historical survey, but rather a journey of the imagination.